Sergeant Tim O’Neill, Chief Ron Tischer and Sergeant Joe Wiegrefe. 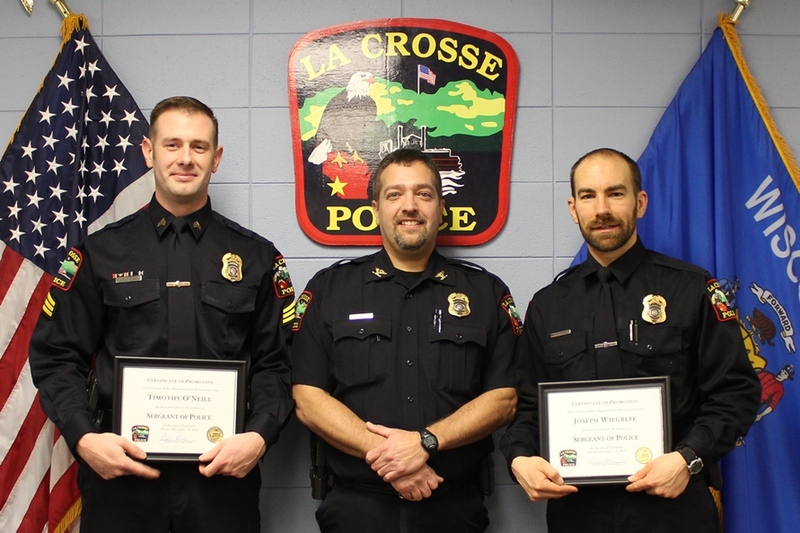 Chief Ron Tischer is pleased to announce two promotions from within the La Crosse Police Department. Officer Joseph Wiegrefe, who currently serves 2nd shift patrol, was promoted to the rank of Sergeant and will continue on 2nd shift. Sergeant Wiegrefe has been with the Department since 2009 and also serves as a Department Field Training Officer. Sergeant Wiegrefe is a veteran of the U.S. Army and was awarded two bronze stars for his service in combat. Investigator Timothy O’Neill was promoted to the rank of Sergeant and will be assigned to 3rd shift patrol. Sergeant O’Neill has been with the Department since 2005 and was assigned as an Investigator in 2011. He has worked closely with the Domestic Abuse Reduction Team (DART) and has served as a member of the Department’s Honor Guard as a Color Guard Team Member. Sergeant O’Neill is a veteran of the U.S. Air Force. Join us in congratulating Sergeants Wiegrefe and O’Neill!